#PKCP8020 | In stock, Ready to ship! "I love this kit, this is an attention getter. Everyone sees my personal pen and asks, where did you buy that. Then i hand them my card, these are an easy sell." "The bolt action pens are some of my top-sellers and make a great conversation piece." "Easy kit to assemble. Looks great and sells very well. I completed this one with an Air Force pen blank and used an eagle/flag pen clip. It also has the space ink refill in it so it will write under water, if you ever had the need along with writing upside down." 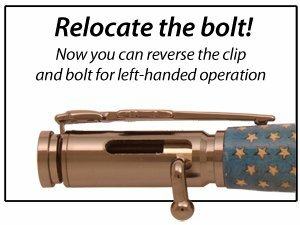 "The bolt action pen kits are fun to make. Everyone likes them and wants to purchase one." "Easy to turn and assemble. Gave one as a gift and sold all the others I had made." "I have built all of the 30 cal bolt action pens and by far the gun metal sells 2 to 1. I make these and take to work. Usually word of mouth and gone in no time. Almost can't build them fast enough." "I have sold many of these pens, Great sellers and a great pen just to have." "I love the gun metal look. As soon as they're made they're sold. Great look and great quality." "Have made 500+ of this style. It is very popular and looks good in coco bolo. The clip needs to be beefed up"
$25 Variety of woodsâ€¦Oak, Cherry, Mahogany, and Stars & Stripes. $30 material sets the price-deer antler to local woods. $35 All type of wood. $35 Red Cedar, Black Walnut, Oak, Antler, Coco Bolo and more. $35 US Flag, Cottonwood, Cheery, Oak, Koa. $40 All types of wood and acrylic unless the material exceeds $5, then price goes up slightly. $40 Various different kinds of wood. $40 Moose & Deer antler, black walnut, etc..
$45 Mepal, as well as a whole bunch of other types of woods. $45 All types + used color pens and burned stripes with thin strings. $45 Deer Antler (sells the most), Buffalo Horn and acrylics like the Camouflage Blanks which are very popular. $50 Deer Antler with Purpleheart bullet hole and bloodwood sliver-moon beside the purpleheart plug.